Mother’s Day is quickly approaching, and unlike years past, I am prepared this year! 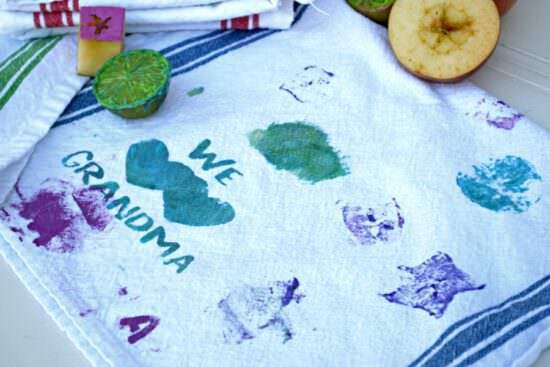 I always want my girls to make something for their grandmas, but I would always leave it to the last minute to come up with an idea, usually frantically searching Pinterest for something they could create for those two special ladies. 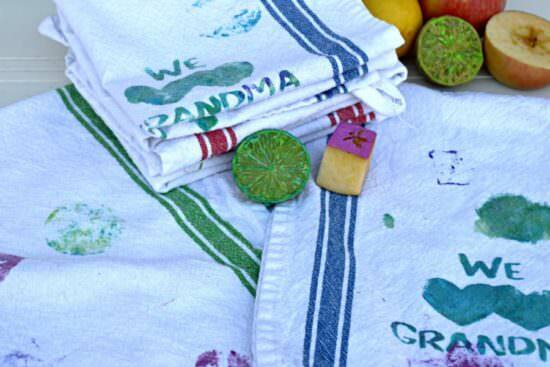 This year, I have a little more time on my hands (and brain power) now that I’m not working full time, and I came up with these fruit-stamped kitchen towels as the perfect DIY Mother’s Day gift. I love that kids can make these, and have fun while doing it! We first cut pieces of fruit that have neat patterns on the inside. 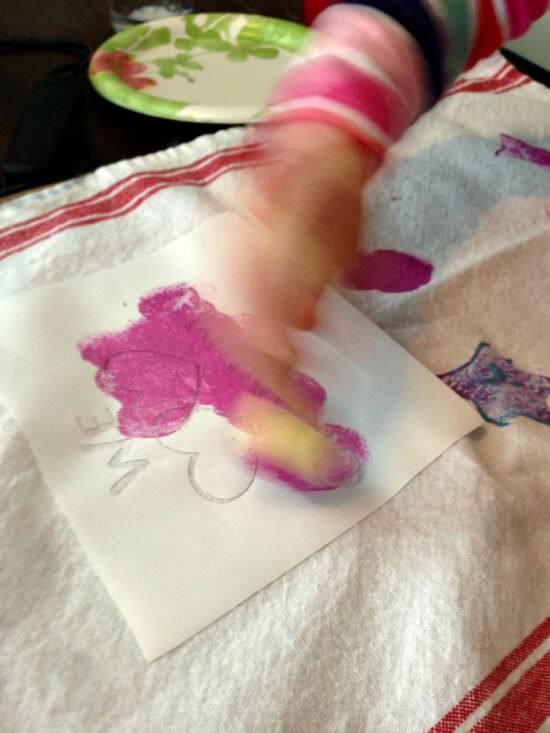 It was fun to have my oldest, who is four, guess what the inside might look like and if it would make a good stamp. We ended up using a star fruit, a lime, and the inner part of an apple. 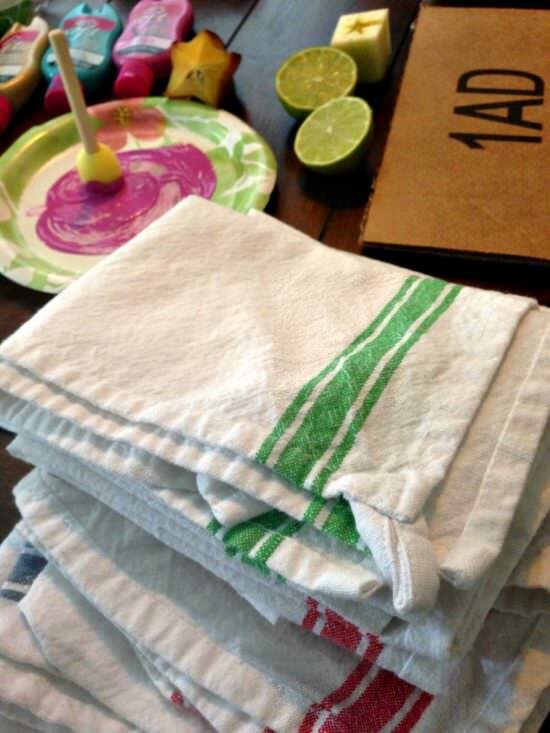 I found these vintage inspired cotton kitchen towels on Amazon, and now that I’ve seen then, I actually might order another pack just to have around the kitchen! 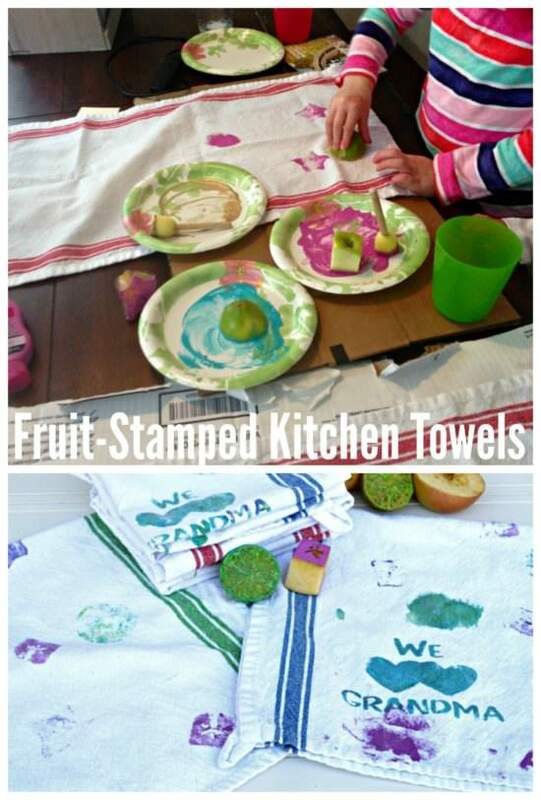 We pre-washed the towels, and then using fabric paint, the girls dabbed the paint onto the fruit (we found this method worked better than dunking the fruit in the paint) and then used them as stamps on the towels. I made a stencil with my Silhouette machine, but you could also just buy some letter stencils to spell out any message. After painting, we let them dry, and then I waited 72 hours before washing them, as instructed on the fabric paint. I must admit, I envisioned that they would turn out a little clearer than they did, but I also have the philosophy that I don’t step in on my kids’ projects. What they created is their own, and I think their grandmas will appreciate the gift that much more. The only part I helped with was laying down the stencil, but they did all the rest! 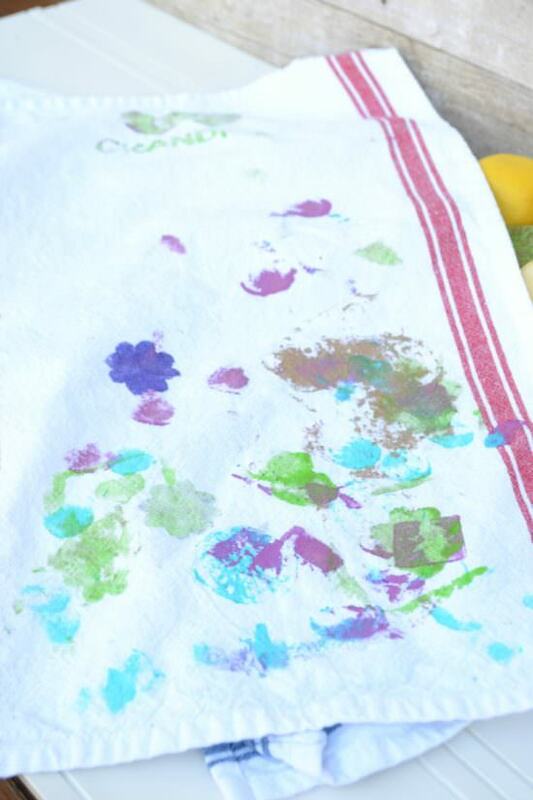 Even my two-year-old was successful at designing kitchen towels for Grandma! Can you make out any of the fruit patterns? After watching my girls make them, I had to give it a try myself. 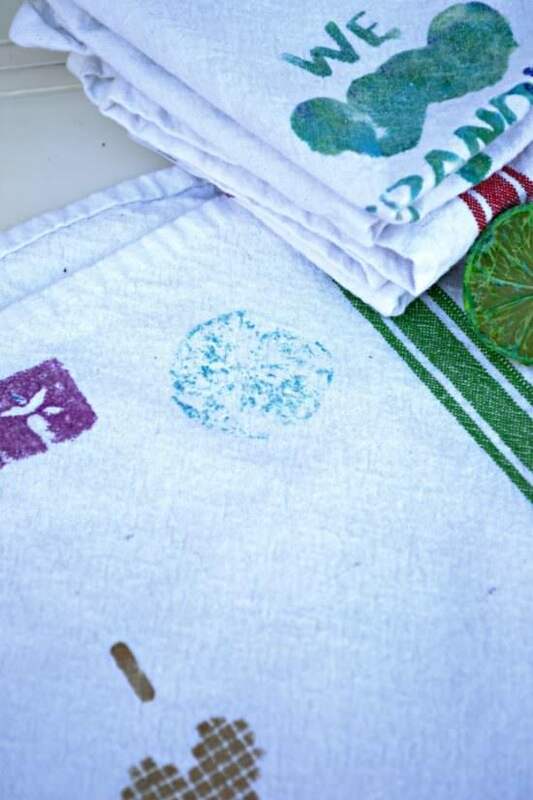 I liked the pattern the lime made the best, but it ended up being a little fainter when I washed them. 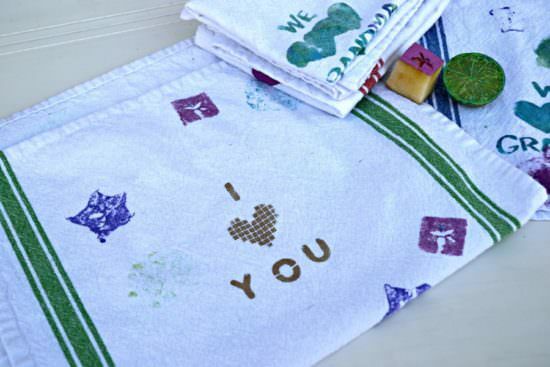 I think any mother or grandmother would be crazy not to love these towels, right? I’m excited for the girls to give them their gifts, primarily because it’s something they made and can be proud of. Like this idea and don’t want to forget it for next year? I’d love for you to pin it! Thanks, Tania1 I think they will love it, too! 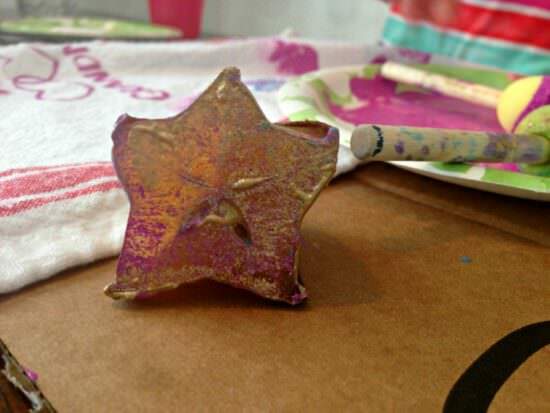 These are darling and I completely agree with not steping in on the kids masterpieces. 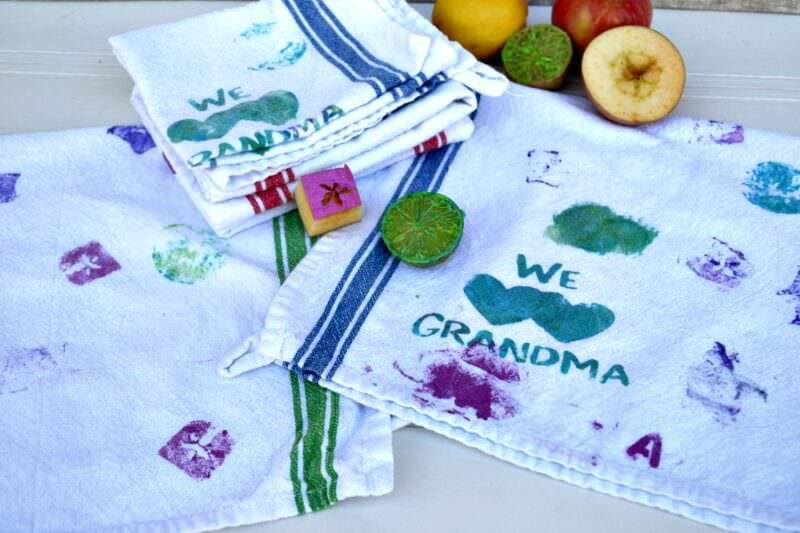 I know the Grands will love these heartfelt gifts!